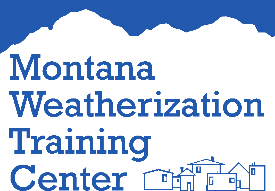 The Montana Weatherization Training Center is a Building Performance Institute (BPI) testing center and CEU provider. Some of the classes taught at the center qualify for CEU credits toward Home Energy Professional (HEP) Recertification. According to the Building Performance Institute, Home Energy Professionals must recertify every 36 months with both a written and practical field exam. If a certified individual participates in 24 units of approved CEU courses before the expiration of the certificate, then the recertification will consist of the field exam only. CEU units offered by the Montana Weatherization Training Center are listed below. You can go to the BPI website to view all of their approved CEU opportunities anywhere in the country. You can read the full BPI Continuing Education Unit (CEU) Policies and Procedures manual on their website. If you are unsure how many CEU's you need to maintain your BPI certification, you can read more about BPI Certified Professionals requirements on the BPI FAQ page as well.